I was ridiculously good at my job. 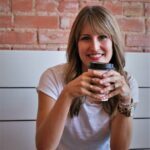 I was a career woman working for a great company that was young and energetic and on the rise. I reveled in my role and was on fire for my job. Each day I walked in with a purpose and walked out with affirmation that I was good enough, that I mattered. It was exhilarating. My job was a safe space for me. Safe from the pressures of a marriage that felt suffocating and troublesome. Safe from the demands of motherhood and a very difficult child who pushed me, each day, to feel like a failure. Safe from the voices in my head that told me that I was not good enough; never good enough. When I walked in, I could leave all of that behind and cocoon myself to the stresses of my outside life. My company was ingenious. Not that we were selling anything new and innovative–we weren’t. But the leadership approach was brilliant: build a company on the backs of rhetoric that was tailor-fit to bright young minds hungry for recognition. “If you work hard and play hard you’ll see success, you’ll rise in the ranks, and you’ll make bank.” Positive feedback was given repeatedly to the chosen few, those who showed up, worked hard and gave blood. I needed that positive feedback so badly that I gave blood. And then some. I gave it all. I gave more. I sold my soul to a company that ate it up. I crashed and burned. I bought the lie and replaced my true value and worth with a company slogan. I went to happy hours instead of football practices or school plays. I bought the clothes with money I didn’t have, so I could look the part. I traveled and lived the life of a single person, despite being married with three kids. And I ended up having an inappropriate relationship with a co-worker. That’s the thing about fire. Its warmth is intoxicating. On a cold night, it provides comfort and life. But left unchecked and uncontained it’s dangerous and destructive. It burns up everything in its wake. My fire was destructive. It ripped through my life, leveling me to the ground. When the smoke cleared, I was left a barren wasteland–no job, a marriage hanging on by a thread and relationships destroyed. I was an empty shell, open and exposed to myself and everyone around me. I was everything I was running from for so many years. But fire, it’s a funny thing. It can serve a purpose. It can fulfill a need. In the forest, fires clear out dead limbs and debris. The ashes return nutrients to the soil, preparing it for new life to come. And my fire, it did just that. It left me broken, alone and barely alive. I couldn’t get up; I couldn’t move. I had nowhere else to turn. I spoke to God then. He was the only one left. I don’t remember what I said. It might not have even been actual words, just guttural groans of sorrow and shame. But God was there and God saved me. God is always there. God always saves. I believe that God sometimes lights fires in our lives to get our attention. There were so many times I should have listened and turned back from my path of destruction. I should have heeded the warnings and the alarm bells in my heart, but I didn’t. Ultimately I crashed and burned. Because I was meant for more than the life I was living. Emotional debris needed to be removed. Good nutrients needed to be returned to my life, the nutrients of life and love and grace. A fire was the only way to go. Little by little, as I rebuilt my life, repaired my marriage and mended my soul, a new flame started to flicker. A new fire was being lit. A fire that would eventually be a comfort and not a destruction, a fire of light and not death. A fire for the One who was there, who is always there. He spoke grace over me and mercy flooded my soul. My fire now burns to share that grace, to share my story. 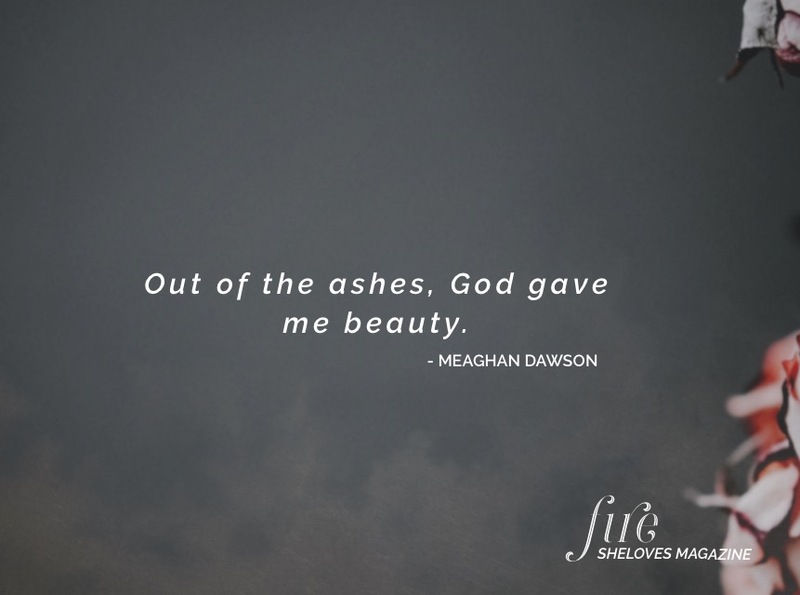 Out of the ashes, God gave me beauty. Out of the fire, God gave me life.